Have you heard of a "reverse merger" company? The SEC describes a reverse merger as : "In a reverse merger transaction, an existing public “shell company,” which is a public reporting company with few or no operations,1 acquires a private operating company—usually one that is seeking access to funding in the U.S. capital markets." I got that quote from an SEC investor warning about reverse merger companies. On the same topic Forbes says in How to Spot a Pump and Dump of reverse mergers that " this variety of reorganization happens to be a common first step in penny stock scams." If you'd bought any of these you'd have lost all or virtually all of your money. Recently there have been several Chinese companies that did reverse mergers with virtually dead US companies merely as a method of getting into the US stock market. Several of these companies have had some major issues with their financial reporting. Some people allege that there are Chinese companies perpetrating financial fraud and reporting false information to the SEC. This article claims: 1 in 10 reverse mergers of Chinese firms on US stock exchanges "fraudulent" I'll leave it for the authorities to decide who is committing fraud and who isn't. But there is sufficient reason for concern. For these reasons I would be particularly careful of Chinese reverse merger companies. Personally I think that buying stock in foreign companies should be left to the experts and that individuals are best to go with index funds if want to buy foreign stocks. How do you spot reverse merger?? Item. 5.06 Change in Shell Company Status. As a result of its acquisition of all of the outstanding capital stock of Innomind and the Restructuring Agreements, as described in Item 2.01, which description is in its entirety incorporated by reference in this Item 5.06 of this Current Report, the Company ceased being a shell company as such term is defined in Rule 12b-2 under the Exchange Act. THis is a clear sign of a reverse merger. You may also tell by finding references to a reverse merger specifically in the companies filings. THey should expose this as a risk element in their financial statements. Spotting reverse mergers isn't always easy. For that reason again, in general I'd recommend avoiding buying stock in foreign companies unless you've done good due diligence to investigate them and ensure they are legit. This is not to say that all reverse mergers are bad. Its just a financial mechanism. Some well known names like Atari and US Airways went through reverse mergers. Unless you're talking about a well known entity then I think that the risks involved in buying a reverse merger company are too high for us normal people and so we should avoid buying into reverse mergers. If you use the code CLOUDMP3 you can get $2 of free MP3 downloads from Amazon.com You have to use the free downloads by June 30th. I heard about this one from My Money Blog who heard about it from Slickdeals. A while back I got a magazine subscription for my wife for a gift. After shopping around I got the subscription at Amazon. They had the best price I could find at the time. However I had to use their magazine subscription service to qualify for the rate. They have several popular titles for cheap : Magazines under $12 including $5 off select magazines until July 6th. I would also try checking the prices using Ebates to get a 26% cash back at Magazines.com. Some magazines will be cheaper going that route. I usually have 1-2 magazine subscriptions on and off. I get the subscriptions because I like to have a magazine to read on the plane when I'm traveling and in other such situations. Generally I've found that I spend a lot less with a discounted subscription than I would spend buying 1-2 magazines at the newsstand at full price. For this reason magazine subscriptions are a good buy for me. Recently I saw a commenter on The Simple Dollar said something that sounded like he didn't think cancer rates were age related. As you can see in the data below, cancer rates are very age related. I got the data from the National Cancer Institute's Surveillance Epidemiology and End Results SEER website. The figures are for 2004-2008. These are the rates of cancer incidence per 100,000 people for each age group. The low is for years 5-9 when the rate is 11.9 and the peak is at age 80-84 the rate is 2,444. The incidence rate for the population as a whole is 464. These incident rates are per year, so people in their early 80's have about a 2% annual rate of being diagnosed with cancer. This data is for all forms of cancer. Different types of cancers have different incident rates. 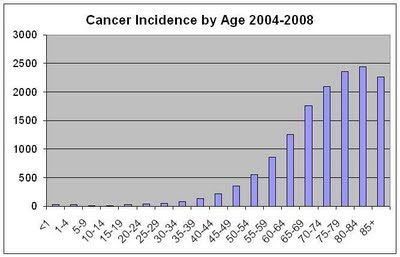 Most cancers follow a pattern similar to the graph. 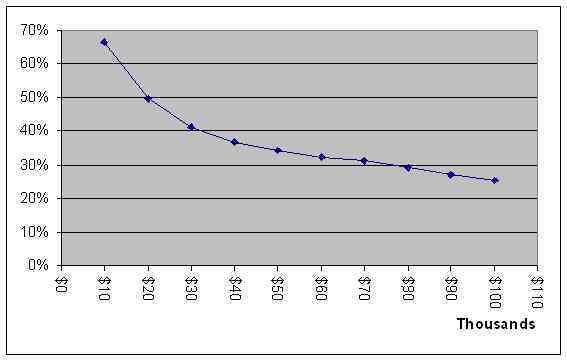 However there are exceptions, for example testicular cancer in men peaks in the late 20's. State governments employ millions of people in a variety of roles. The U.S. Census has data on state and local government employment. 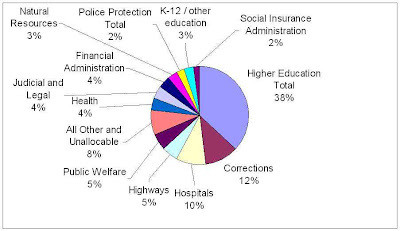 I used the 2007 State Government data to compile the information here. In 2007 state governments had 4,306,623 full time equivalent (FTE) employees. FTE employees is a combination of full time and part time. You can see that higher education and education in general is the largest segment of state government employment. The next largest area of employment is corrections (prisons/jails) and then the third highest is hospitals. GetRichSlowly asks Hourly vs. Salary: Which is Better? Do American Women Buy 52 Items of Clothing a Year? In a recent article on Get Rich Slowly the author stated "The average American woman now buys more than 52 items of new clothing each year". The number seemed crazy high. I figured it was numerical fiction. I decided to go about proving it wrong but ended up proving it right instead. The figure 52 items of new clothing came from Juliet Schor, In her paper Cleaning the Closet: toward a new fashion ethic she says on page 9 that : "In 2000 alone the US imported 12.65 billion pieces of apparel, narrowly defined (i.e., not including hats, scarves, etc.). It produced another 5.3 billion domestically. That’s roughly 47.7 pieces per person per year. (Women and girls’ rates are higher; men and boys’ lower.)" In 2005 we imported $80B in clothing and exported $5B. 29.1% from China in 2006. American Apparel and Footwear has some figures on clothing imports. In 2009 we imported about 21B square meter equivalents of apparel at a cost of about $63.1B. The report Textile and Apparel Imports from China: Statistical Reports from the United States International Trade Commission has counts of the number of individual items imported from China as well as the percent of imports that come from China. Table 3. in the document gives "Quantity of U.S. imports from China by category, for indicated units, 2003–09" Then in Table 4 we can get the "Quantity of U.S. imports from China as a share of total U.S. imports by category (percent)," If you combine these two figures you can get the total quantity of items that the U.S. imports worldwide for each category. Here are major clothing item categories numbers from Table 3 and the % of total imports from Table 4. THe far right column is the total number of imports worldwide. The total numbers are in millions of dozens. If you sum up the totals you get 1,310 dozen million or 15,716 million. Thats 15.7 billion items of clothing we import annually. Divided by approximately 300 million people in the U.S. and that gives us a total of 52 items per capital. The other day on a blog article I saw a commenter who said that they had heard that Americans are exposed to 5,000 advertising messages in an average day. That sounded like an example of numerical fiction. The number didn't seem close to realistic. I figured I would do a little research into it and see where these numbers come from. The Story of Stuff also references the same statistic from the same source according to Wikipedia. As far as I can tell the 3000 figure comes from Ellen Goodman I suspect she did some study that claimed that number and then it was cited and repeated across the other sources as fact. I don't find anything directly from her that explains the figure. In fact I don't see an explanation behind any of the numbers. In a given 24 hour period you do a lot of things that have no exposure to advertisements. You need to eat meals, shower, sleep, dress yourself, etc. You probably spend a good 10 hours doing such activities. In a given workday you will also spend 8-10 hours at work and commuting. Lets say I browse the web for 2 hours. Thats 120 minutes of web surfing. If I spend about 1 minute per page and visit about 120 pages. If I see 2 ads per page that would be a total of 240 ads in a 2 hour period. If I watch TV for an hour then about 22 minutes of the hour will be advertisements. In a given minute you generally get 1-2 commercials. That will result in seeing about 44 commercials in an hour of TV watching. Watching 5 hours of TV would give you 220 commercials. If I spend 7 hours on the internet and watching TV then that still only adds up to around 460 advertisements. You can of course also see advertisements in other places like reading a newspaper, reading magazines, listening to the radio, or seeing ads on billboards and the sides of buses. If you add it all up then I think that a figure closer to 250- 500 is realistic. Now that is just my opinion based on my very quick guess. However I think it is a lot more realistic than a figure like 3,000 or 5,000. OK lets think about this. Theres 24 hours in a day, 60 minutes in an hour and 60 seconds in a minute. That gives us 86,400 seconds in a given day. If you're exposed to 5,000 ads a day then that means on average you see an ad every 17.28 seconds for every single second of the day. If we assume you aren't exposed to ads while you sleep 8 hours then that makes it even worse at 11.52 seconds per ad on average. Even if you're watching a pretty heavy barrage of commercial TV you only get about 1 ad per minute. Worst case if you did nothing but watch TV all day you'd see only around 700 ads. Today you can get $50 of product at VistaPrint for $10 via Livingsocial. If you're not familiar with them. LivingSocial is a daily coupon service similar to Groupon. You sign up via email and they send your their daily spam offers. VistaPrint makes all sorts of stuff like address labels, business cards and photo products. Today you can get 12% cashback on purchases at Drugstore.com via Ebates. I also get a referal bonus if you use my linksto sign up with Ebates. We send a lot of greeting cards. Individually paying $3-$5 per card doesn't seem like a big deal but it starts to add up. Off the top of my head I'd guess the sum of occasions and the number of cards we send are : Anniversary = 2, St. Valentines = 2, Birthdays = 6, Xmas = 6, Mothers / Fathers day = 4 That adds up to about 20 greeting cards per year. If we spend $4 each on average to buy traditional cards in the store than we'll spend $80 per year total. Of course you don't have to spend that much per card. We've done so mostly because its just what we're used to doing and I haven't previously put too much thought into it. There are a lot of ways to save money on greeting cards. I'll discuss a few options today. note: The products linked to here are just for example sake and to cite example prices. I haven't used these products and I can't say if they're good so I'm not specifically recommending them. Its smart to do your own research on such things. Cost : Software = $13+ , Paper & Envelopes = 50¢ ea. You can get computer software like Hallmark Card Studio Deluxe 2010 for $13.28 and then print cards at home. The software has thousands of designs and lets you do lots of customization. The reviews on the software available is mixed and some people have problems getting it setup and working well. Cost : Subscription for $15-20/yr, Cards & Envelopes = 50¢ ea. There are several online services that let you create and send greeting cards. Hallmark, American Greetings and others are available. Top Ten reviews site gave American Greetings the #1 ranking in their reviews. American Greetings has subscription plans for $3.99 per month, $19.99 for a year or $29.99 for two years. With that you can send unlimited e-cards and you also get unlimited print at home cards. The service is pretty easy and gives you tons of options and flexibility. A few weeks ago we bought some general purpose cards at Costco. I don't remember the exact price, but I think we spent around $20 for 20-30 cards. These cards look great and they are really easy. I found a similar product at Amazon this pack of 30 cards is $32.95 : 30 Handmade All Occasion Greeting Cards with Decorative Reusable Organizer Box These are pretty fancy cards too. There is also a cheaper and plainer All Occasion Card Asst, Set of 30 for $12.95. My mom used to buy cards from a company named Current. They sell a set of 20 general occasion cards for $5 + $5 shipping. If you buy a couple packs you could get 50 cards for under $20. You can always just grab a piece of paper and write your own message on it. This can be essentially free if you ignore the marginal cost of a piece of paper. You can also buy printable blank cards and envelopes like those mentioned above and use those. Making cards by hand that look decent requires some sort of artistic skill so this option isn't for everyone. It can also be more time consuming. However a nicely hand made card can add a personal touch and the extra effort may be appreciated. More than once I've seen unused greeting cards for sale in thrift stores. You may be able to pick up some nice cards for a bargain price. However the selection will be extremely random if you can find cards at all. Bottom Line: There are a variety of ways to get greeting cards for closer to 50¢ to $1 range and by doing so you can save yourself a fair amount of money over a year. To get the free subscription you have to sign up as a member and do surveys or the like to gain enough points to qualify. As a first time member its not too hard to get the points necessary. I've done this myself in the past and its a legitimate deal. If anyone is interested, you can now get Free By 50 on the Kindle The cost to subscribe is 99¢ per month ( I get a cut). I understand the Kindle has a basic web browser built in. So I would highly recommend using that to read Free By 50 for free instead of paying. But I don't own a Kindle myself so I can't tell you how best to go about doing that. If you prefer the subscription service then its now available. 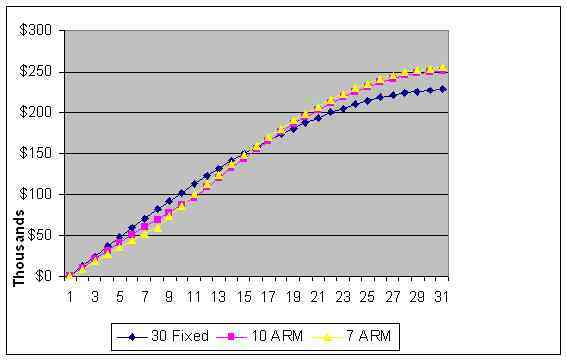 Generally I think that a fixed rate mortgage is a better bet than going with an adjustable rate mortgage (ARM). I say that because the fixed rate is a guaranteed rate with no surprises or risks. Of course the ARM's do have lower interest rates to start so they can save you money for the first few years. After the ARM resets though you don't know what you 'll pay and it could be several percentage points higher than what a fixed mortgage would currently give you. If you know you will move within a shorter period of time then an ARM can make more sense. On the other hand, your plans don't always work out as you'd thought. Its a given that an ARM is going to save you on interest in the first few years over a fixed rate mortgage. After the ARM adjusts though, the rates generally go up. If you're lucky then the going interest rates will be low when your rate adjusts and you'll then have lower interest costs. Another benefit in the ARM is that the principal is decreased a the loan ages, so you have lower interest rate at the start with higher principal but higher interest later when principal decreases. For this reason I'd rather pay 3% for 15 years and then 5% for 15 than have 4% for 30 years. I wondered, if you might expect the lower interest rates early in the ARM to make up for the higher interest rates later on. I'm going to look at some examples of how ARM mortgages might compare to a fixed rate mortgage over time. These are just examples based on example ARM mortgages I found. Different mortgages will have different terms and rates. I'm also going to make some arbitrary choices about how interest rates might change in the future, but nobody can tell what interest rates will look like 10-30 years from now. I cut it off at 15 years but the trend continues with the ARMs just getting more and more expensive in the last 15 years. 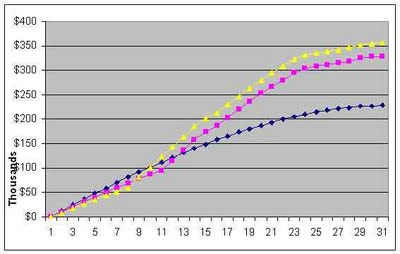 The blue line is the 30 year fixed interest loan. With that loan you are guaranteed to pay more than the ARMs in interest for the first 10 years. 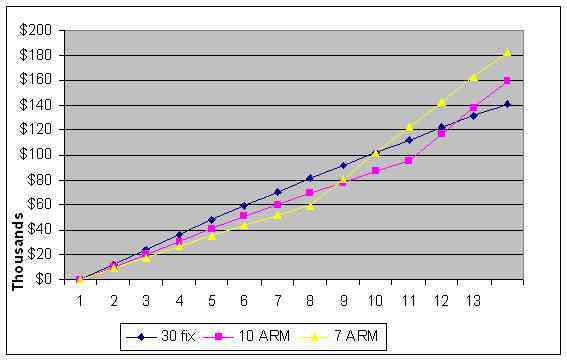 The 10 year fixed ARM actually puts you ahead of the 30 year fixed for at least 12 years. Once you get past that the ARMs both end up being more expensive in the long run. I also decided to see how the loans would compare if LIBOR fluctuated. I chose to use historical LIBOR rates from a past 20 year period just as an example situation of real life LIBOR interest rate changes. Below is what the total interest paid would look like if you held each of the loans for the full 30 years and the LIBOR performed like it did from 1988 to 2008. 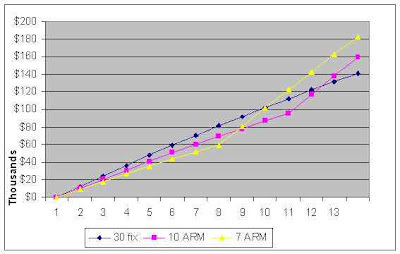 As you can see the ARMs in this example still end up with pretty significant costs over the 30 year term compared to the fixed rate loan. That doesn't look so bad. But you're really just taking your chances that the rates will be favorable in the future. Its quite possible that when your ARM adjusts it will be in the middle of a high interest rate period and you could be stuck paying the max 8% rates for the ARM for a long time. As you can see in the first graph it doesn't take long to end up paying more with the ARMs if you end up in a high interest environment when it adjusts. There are two situations that I think an ARM is an OK choice. If you KNOW that you will only be in the home for a few years then an ARM can be a good choice. I think few people are really in this kind of situation, but I'm sure some people are. Another case where ARMs may make sense is if you have sufficient assets to pay off the mortgage if or when necessary. In most cases though you will be best going with a fixed rate loan. This is especially true in todays very low interest rate environment. There are now two new ways to view FreeBy50. There is now a viewer for the blog that just shows the articles. If you want to read the posts without all the clutter in the right and left columns and without advertisements (as far as I see) then you can use this viewer. The alternate viewer is at FreeBy50.com/view The viewer has a few different ways to look at articles with flipcard, sidebar and others. This is a stripped down version of the site that looks a lot better on many smart phones. and they answer What is a Flexible Spending Account? How Much of Your Income Does Social Security Replace? Social Security is a large part of retirement income for most Americans. If you're planning for your retirement then it is useful to have an idea of how much your Social Security income will be. I wrote before about exactly how your Social Security monthly benefit is figured. It is pretty complicated. Today I'll just give a rough figure for how much of your pre-retirement working wages Social Security typically replaces. The Social Security site has a 'quick calculator' that will give a rough estimate of what your SocialSecurity benefit will be. Using the calculator I found the Social Security monthly amounts for various income levels. Then I figured how much of your working income that would equate to. I just used the default of someone who is currently 61 years old and then got the standard SS rate for retirement at age 66. As you can see the more you make the less of your income that Social Security replaces. Of course your actual payments are bigger. If your wages were $20,000 then the monthly check is $830 which is 50% of your income, but if you made $100,000 then you'd get $2130 from SS which is 26% of your wages. Keep in mind that this is just a rough estimate. Your individual situation will differ depending on how many years you worked and your exact income per year. The quick estimator just makes blanket assumptions about the wage history to give its rough estimate. Current Unemployment rates per state are listed below. This data is from the BLS.gov website. Getting scholarships to help pay for college is a common strategy. It can be a pretty good strategy for sure. I think that applying for scholarships is a great idea. If you can win any then its well worth the time and effort to try. I got a private scholarship from a regional chapter of the National Society of Professional Engineers Mine was $1,000 regional prize (20 years ago) and all I had to do was fill out an application, write an essay and do an interview. I had a 3.9+ GPA and I had won several academic awards in high school. Less qualified applicants didn't get scholarships. It seems that I hear a lot of people who expect or hope that their kid will get some form of scholarship. Most private scholarships are based on merit and are highly competitive. Finaid.org reports that for 4 year college students "8.3% of undergraduate students received private scholarships worth $2,796 on average in 2007-08". That means that 91.7% of undergraduates got no private scholarship money. Very few students actually get academic scholarships. I would not expect most students to have any realistic shot at getting a merit based scholarship. Of course there are exceptions where scholarships are little known or advertised and have few applicants, but I would expect that these are rare situations. There is little reason to think most free money would go unnoticed or ignored. Universities give out need based aid more than merit only aid. While grants from institutions were received by 19.9% of students, the institutional merit-only grants were received by only 8.8% of undergraduates. "merit only grant" is another way of saying scholarship. The universities giving merit scholarships are heavily weighted towards the more expensive schools. Universities that cost less than $6,000 to attend only gave aid of any form to 7.2% of students while universities that cost $19,000 or more gave aid to 43.2%. Often time the scholarships given by universities only partially reduce a high tuition bill. When I applied to colleges one private school in my home town awarded me a few scholarships. However even with the scholarships it was still more expensive than our state public university. I applied to some out of state universities and most of them gave me scholarships as well but none of them were affordable. In the end I went to my local public university with no scholarships and it was still the cheapest. Think of these scholarships at private universities like a 20% off sale at Nordstroms... its still more expensive than Sears. The vast majority of students do not get merit based scholarships from private groups or colleges. If a student excels academically then they should certainly pursue scholarships, but students or parents of students who are only average students should not generally expect academic scholarships. I've mentioned several times before that I enjoy an occasional trip to Las Vegas. I also enjoy buying an occasional lottery ticket. For me gambling is just an entertaining diversion where I can spend $10 or $20 at a time for an interesting diversion and a chance at winning some money. Compared to the usual Vegas gambler which spends $559 per trip on average I spend very little on gambling. Most of my money in Vegas goes to hotels, show tickets and buffet trips. Most of the people I know who go to Vegas spend a lot more on gambling than I do. How much Do Americans lose in Gambling? This article Gambling : The Biggest Losers on The Economist shows how the USA compares to other nations as far as amount of gambling losses per adult. The chart has bar graphs rather than exact figures but you can see that the value for the USA is around $375 loses per year per adult. American Gambling Association gives figures for the total amount of commercial casino gross gambling revenue. This figure is the amount of money the casinos keep after prizes are paid out. 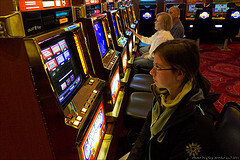 In 2010 the total gross gambling revenue was $34.6 billion. There are also many Native American casinos across the country. Wikipedia article on Native American Gambling cites that revenues from Indian casinos is $18.5B. Before I talked about state lotteries and gave some information on the payout rates. Going back to the same source I got those numbers from we can also get information on the amount of money wagered and taken in by thee states. They say that the total net sales by lotteries was $53.7B and prizes were $34.6B so that means that states took in $19.1B after paying out the prize money. If you add these three up then thats $34.6B from commercial casinos + $18.5B for Native American gambling + $19.1B for state lottery = $72.2 B in gambling losses by individuals. The Census says that there are about 129.9M households in the USA as of 2009. With $72.2B in gambling loses nationally that comes out to about an average of $556 in gambling loses per household annually. However I should point out that some portion of the gambling loses in the USA are from tourists who are not US residents. The actual amount lost by US residents is lower than that $556 figure. Whether the loses are $375 per adult or $556 per household these are pretty large numbers. The amount lost gambling by Americans is a pretty significant impact on our household finances. We should keep in mind that these are just averages and that they will be skewed high by individual heavy gamblers. Gambling to some extent is pretty common in America. Most Americans gamble in one form or another. A Gallup poll from 2007 reported that 24% of Americans visited a casino, 46% bought lottery tickets and 17% wagered on sports. All together the poll reported that 65% of the people surveyed had gambled in some form or another. That still leaves about 35% of the population who didn't gamble. For most people gambling is an entertaining diversion but for some people it is a serious addition that can cause financial ruin. An article hosted on the Justice dept. site says "One research group suggests that about 10 percent of bankruptcy filings are linked to gambling losses, 20 percent or more of compulsive gamblers are forced to file bankruptcy because of their losses, and upwards of 90 percent of compulsive gamblers use their credit cards to gamble" and that "Harvard Medical School researchers estimate that around 1.3 percent of American adults have a gambling disorder." The National Council on Problem Gambling says that among people calling a Wisconsion helpline for gambling problems "The average gambling debt of those who called in 2010 was $43,800"
Co-insurance is a term that is new to me in the past few years. When I first got my insurance at work I had a small co-pay but no co-insurance. At that time I had no reason to be worried about co-insurance. Over the years our insurance options have changed and I now have a policy with co-insurance. Co-insurance is a portion of the costs that the health care recipient is responsible for paying out of pocket. Generally co-insurance is a percentage figure. The co-insurance will kick in after a deductible is met and then stop after the total out of pocket is met. The higher the co-insurance then the more you have to pay and the less the insurance pays. Whats the difference between a co-pay and co-insurance? A co-pay is generally a fixed amount of money that you have to pay for a given service. You may have a co-pay of $20 or $25 for a doctors office visit or a $10 co-pay for a prescription. The co-pay is fixed at a specified amount. With a co-insurance you are paying a percentage of the costs so the exact amount you pay is not fixed and depends on the cost of the health care received. Generally co-insurance applies to any or all services you receive. Is co-insurance Good or Bad? Its bad if you have to pay it. But if you don't have to pay it then higher co-insurance can keep your monthly premium lower. Cheaper plans may have higher co-insurance rates, this can keep your monthly premiums lower but you'll run the risk of higher out of pocket costs above your deductible. Generally every health insurance plan will be a balance between monthly premiums and risk of higher out of pocket costs. If you are pretty healthy then a higher deductible and higher co-insurance plan could be cheaper for you overall, but carry a risk of higher costs. On the other hand if you pay more monthly then you don't take the risks of high out of pocket costs but pay more up front. The exact rate will depend on your insurance plan. I've seen co-insurance rates in the 10-30% range on ehealthinsurance and my policy is 10%. But I have heard of co-insurance as high as 50%. You pay co-insurance for any costs incurred above the deductible but below the out of pocket limit. Its easiest to explain with an example : Lets say your insurance has a $1,000 deductible, 10% copay and a $15,000 out of pocket maximum. You go to the doctors office for a ear infection and they charge you $184. That is under your deductible so you pay that full $184 out of pocket. You haven't met your deductible yet so the co-insurance does not apply. Then you go to the doctors with stomach problems and you get a bunch of tests run. That costs you $1,242. You have $816 remaining to hit the deductible so the first $816 of the bill you have to pay in full. That leaves $426 left above the deductible. This is where your 10% co-insurance kicks in. You pay 10% of that amount or $42.60. The insurance will then pay the other 90% or $383.40. Lastly you have to go in for surgery to fix your stomach problems and thats a really big bill of $24,346. Again you pay 10% of the bill or in this case that would be $2,434.60. Your insurer pays the remaining 90%. You will continue to have to pay 10% of any costs until you hit the total out of pocket maximum. Since the out of pocket maximum is $15,000 you'd have to have medical costs of over $141,000 for the year to hit the limit. 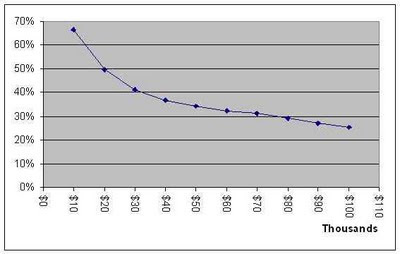 For the example above this is what the responsibility for health costs would look like between you and your insurer. 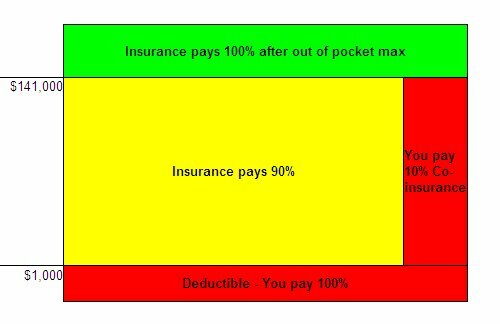 The red bits are what you pay and the yellow and green are what the insurance pays. If you have an insurance plan with a co-insurance rate then it is important to understand what it means. If you don't fully understand co-insurance then you might assume that your obligation ends once your deductible is met, but that won't be true.